Lincolnshire based business County Turf has been officially recognised by the Olympic Committee as a ‘Supplier of natural sports turf (Olympic Venues) to the London 2012 Games’. 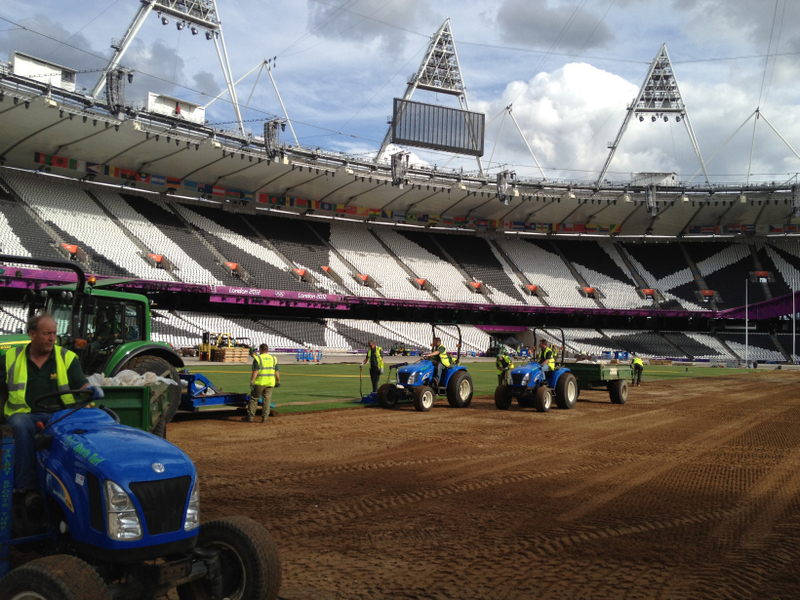 It’s been almost 3 years since family run Lincolnshire firm County Turf embarked on their most ambitious project to date; supplying over 100,000 metres of custom grown turf for London 2012 Olympic Games! 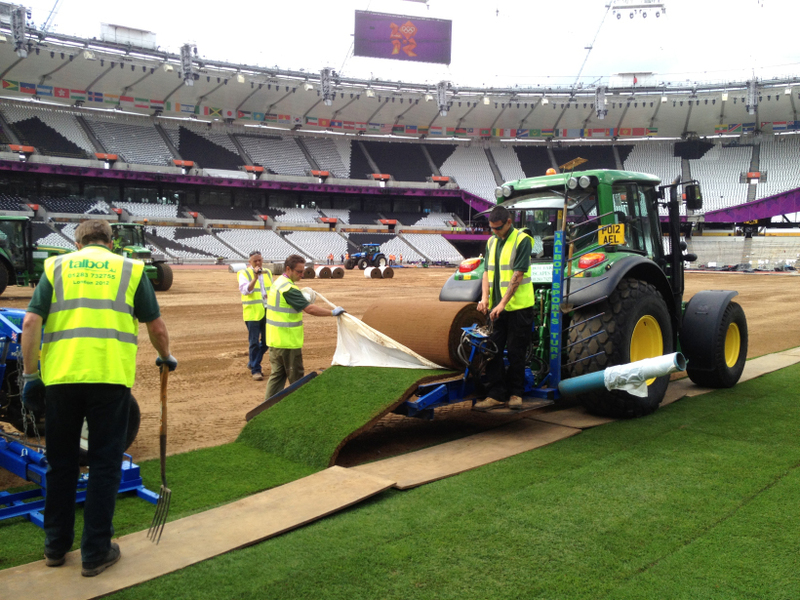 They were also part of a team who had the challenge of installing the natural turf in the Olympic Stadium in only 12 hours! It was in July 2009, that County Turf were delighted to be awarded the contract to custom grow the infield turf for the Olympic Stadium by Leicester firm, Hewitt’s Sportsturf, who constructed the whole Olympic Stadium Bowl. Work began immediately and an exact specification for the turf was constructed, which dictated the species content, soil particle size analysis and percolation rates of the root zone. Just over 18 months later in March 2011 a joint effort between County Turf and Hewitt’s Sportsturf saw the initial turfing of the Stadium completed. Hewitt’s constructed the infield grass area, base upwards, finishing with a 100mm layer of fibresand and then prepared the surface to exact levels prior to receiving the Lincolnshire grown turf. The whole job required meticulous planning, expertise and preparation from both companies to ensure a perfect finish. However the biggest challenge was yet to come, as the teams had to complete a further 2 installations whilst the Olympic Games were in progress! After Danny Boyle’s amazing opening ceremony, they sprung into action and removed and replaced the original turf with a completely new perfect surface in only 12 hours, an Olympic record itself! Andy Fraser, Managing Director of County Turf said “A 12 hour schedule is extremely tight and there is no margin for error. We had a strict plan in place to ensure success; we built a new specialist harvester unit to cope with harvesting all of the turf in the allotted time, and operated 2 crews of staff throughout the nights to ensure that the turf was only rolled up for a maximum of 7 hours, this is essential as it guarantees a green surface and no deterioration. 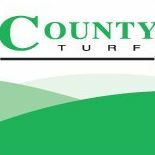 Every County Turf employee was involved from preparation of the field, drilling, growing, harvesting and delivering of the turfgrass. In total the project involved a workforce of 80 dedicated people. Once the turf arrived in London we worked together with sports turf installation experts Talbot Farm Landscapes Ltd to lay the new turf at the stadium and complete the job before the 12 hour deadline. County Turf are one of the leading turf growers in the UK and have plenty of expertise in dealing with large scale stadium projects so it was business as usual rather than an over ambitious challenge, but Fraser admits “there is a lot of added pressure when working on such a high profile project and you have 4 billion spectators to please! We have worked on many prestigious venues, but this project was a once in a lifetime opportunity, the most challenging, most rewarding and definitely the most memorable. Our primary goal from the very start was to provide a perfect natural turfgrass infield, delivered and installed on time. We couldn’t have possibly have achieved this without the help and dedication of all our staff, Hewitt’s Sportsturf and Talbot Farm Landscapes who all worked tirelessly throughout the entire London 2012 project. We are all immensely proud to be part of British and world sporting history; it really was a team effort from start to finish”. County Turf supplied the turf for the main Olympic Stadium, the athletics warm up area next to the Stadium, Greenwich Park where the Equestrian event was held, landscaping areas in the Olympic Park and Lord’s Cricket Ground, after the Olympic Archery event to ensure the test match went ahead only 10 days later.